Raymond F. Gates Scholarship Recipients from the Valley Association of REALTORS®. 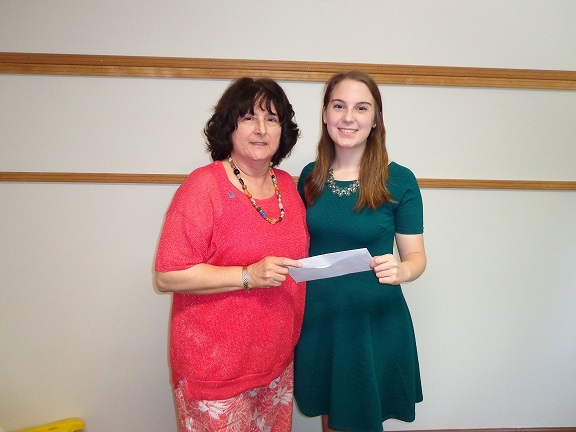 Congratulations to Claire and Kelly (not pictured) Domogala on winning 2 of the $1,000 Gates Scholarships awarded by CTR. Claire and Kelly are the daughters of VAR member and REALTOR® Terri O'Brien of DCK Realty and Design. The Raymond F. Gates Memorial Scholarship Fund was established in 1976 in memory of Raymond F. Gates, Jr. following his tragic death in an automobile accident. Mr. Gates was the Executive Vice President of the Connecticut REALTORS®. 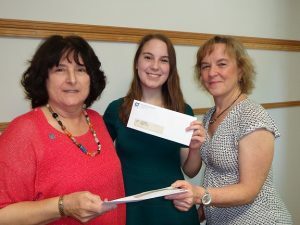 Over the past 41 years, children of REALTORS® have been awarded scholarships totaling more than $886,000. Picutred are 2017 VAR President Rosalie Averill, Claire Domogala and Terri O'Brien accepting on behalf of her other daughter Kelly Domogala. Posted in VARCT News, CTR NEWS | 0 Responses to "Raymond F. Gates Scholarship Recipients from the Valley Association of REALTORS®." 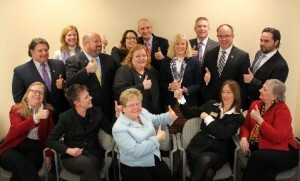 REALTORS® from all around Connecticut will gather together to meet with legislators to share our views on the issues that affect our business. Your participation will help show the legislators that REALTORS® are engaged in the legislative process and we vote. Having a significant size group at this event will make a difference - there is strength in numbers. Posted in CTR NEWS | 0 Responses to "REALTORS® at the Capitol, Wednesday, April 6, 2016"
Raymond F. Gates, Jr. Memorial Scholarship Applications - Now Available! Raymond F. Gates, Jr. Memorial Scholarship applications are now available to access online. If you have a child/stepchild who is a high school senior or college/graduate student (with at least 1 year left to complete) and you have been an active CT REALTOR® member since at least 4/8/15 - he/she is eligible to apply!! CLICK HERE for more information and to access our new online application system. Application deadline is April 8, 2016. Posted in CTR NEWS | 0 Responses to "Raymond F. Gates, Jr. Memorial Scholarship Applications - Now Available!" REALTORS® from all around Connecticut have been coming together to meet with State Senators and Representatives to let them know our views on the issues that affect our business. Having a significant size group at this event will make a difference. Your participation will help show the Legislators that our views are important and we need to be heard. Posted in VARCT News, CTR NEWS | 0 Responses to "Please Mark Your Calendars for REALTORS® at the Capitol! Wednesday, April 29, 2014"
First meeting of the year was held on Friday, January 15, 2015. Posted in VARCT News, CTR NEWS | 0 Responses to "Bryan Atherton, member of VAR and the VAR Board of Directors has a seat on the CTR Executive Committee"
Here are the stats for the September Housing Market! GOOD NEWS!!!! 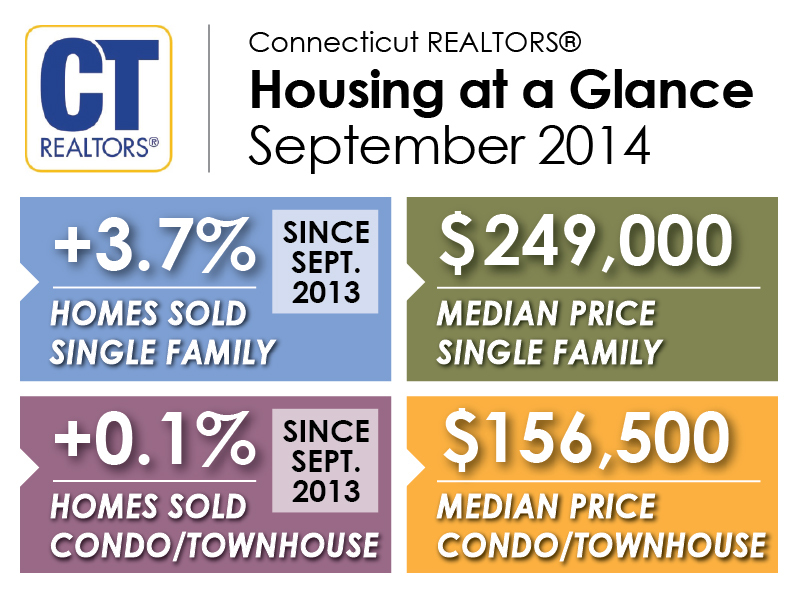 Single-family residential home sales in Connecticut increased 3.7% comparing September 2014 to September 2013. The median sales price of $249,000 represents a slight 0.8% decrease from $252,000 in that same time period last year. Median indicates that half the homes sold for more and half for less. Total units sold were 2,571 in September 2014 and 2,480 in September 2013. 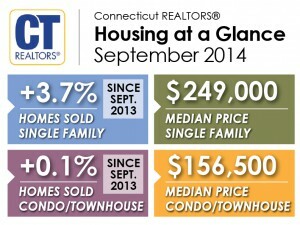 Townhouses and condominium sales in Connecticut increased 0.1% comparing September 2014 to September 2013; with a median sales price of $156,500 representing a 6.8% decrease from $168,000 in that same time period in 2013. Total units sold were 676 in September 2014 and 675 in September 2013. Posted in VARCT News, CTR NEWS | 0 Responses to "CTR September Housing Stats"
Each GRI Series is approved for 30 hours Broker Pre-licensing credit and satisfies the 9 hours of elective-CE credit required for Salespersons & Brokers license renewal. By taking the GRI-2 series you also earn NAR's At Home With Diversity Certification The GRI Designation also counts as credit towards the ABR, CIPS & CRS Designations. Posted in VARCT News, CTR NEWS | 0 Responses to "GRI II @ VAR"
Please attend the Connecticut REALTORS® On October 22-23,will hold its 13th Annual CT REALTORS® Leadership Conference & State/Local Board Leadership Program at the Mystic Marriott in Groton. Posted in VARCT News, CTR NEWS | 0 Responses to "CTR 2014 Leadership Conference "
Welcome Attorney Haseney Connecticut REALTORS® is pleased to welcome Kristen Haseney, Esq. as our new Associate Counsel, beginning yesterday. Kristen joins Attorney Jim Heckman and Paralegal Karen Malenfant in our Association's in-house legal department. Posted in VARCT News, CTR NEWS | 0 Responses to "CTR- Welcome Attorney Haseney"
Posted in CTR NEWS | 0 Responses to "Changes to the Smoke & Carbon Monoxide Detector Law "